Q: According to some media reports, US Secretary of State Mike Pompeo recently made some unfriendly remarks about China and China-Latin America relations while visiting Chile and other Latin American countries. Would you like to comment on that? A: In cooperation with Latin America, China is committed to the principle of mutual respect, equality, mutual benefit and win-win results. With shared development as the aim, such cooperation has given a strong boost to the economic development and improvement of people's well-being in the region. We may look at Chile as an example. Trade between China and Chile reached 42.8 billion US dollars last year, of which 26.9 billion was export to China, a 26.9% increase year-on-year. In 2018, Chinese investment in Chile exceeded 6 billion US dollars, playing a significant role in the economic and social development of the country. Such facts serve to show that it is opportunity that China brings to Latin America. We have taken note of the groundless accusations Secretary Pompeo leveled against China on the Venezuela issue. I would like to point out that China's position on the Venezuela issue is clear and consistent. We are committed to upholding the purposes and principles of the UN Charter and peace and stability in the region. US Secretary of State Pompeo's attempts to slander China and sow discord between China and Latin American countries are irresponsible and nonsensical. We are strongly opposed to it. The US has long been treating Latin America as its backyard, where it would resort to willful use of pressure, threat or even subversion. People can tell right from wrong. I am sure Latin American countries are fully capable of telling a true friend from a false one who is ignoring rules and spreading chaos. I need to point out that for quite some time, certain US politicians have been touring the globe with the same script in their pockets to smear China, starting fires and fanning the flames and sowing discords. Such behaviors are really beneath their dignity. A lie will remain a lie, even if repeated a thousand times. Monsieur Pompeo might as well take a break. Q: As Premier Li Keqiang has just concluded a visit to Europe, we noted that in both the China-EU Summit Joint Statement and the Guidelines for Cooperation between China and Central and Eastern European Countries (CEECs), there are expressions about continuing to forge synergies between the Belt and Road Initiative (BRI) and the EU Strategy on Connecting Europe and Asia. We get the general impression that lately, EU agencies and member states and various social strata in Europe are paying more attention to and taking a more active part in the BRI. With the second Belt and Road Forum for International Cooperation (BRF) just around the corner, what do you think of the prospects of BRI cooperation between China and Europe? A: Indeed, BRI cooperation is a key area of China-Europe cooperation. 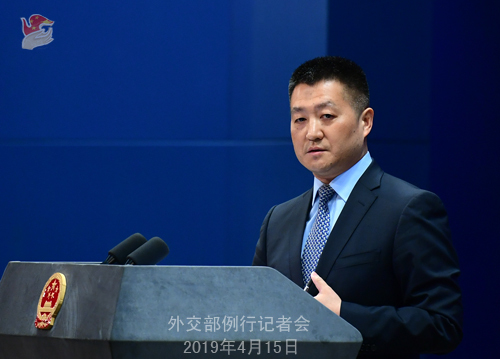 It is the two sides' shared hope to forge synergies between the BRI and the EU Strategy on Connecting Europe and Asia to achieve common development under the principle of consultation and cooperation for shared benefits. As of today, the 16 CEECs and Greece have all signed BRI cooperation documents with China. Only recently, some other European countries such as Italy and Luxembourg also signed relevant MOUs with China. Going forward, China stands ready to work with the European side to seek synergies between our respective development strategies to better leverage comparative strengths and enhance cooperation in such areas as connectivity, production capacity and equipment manufacturing for win-win results and shared prosperity. The upcoming second BRF to be held in Beijing will be attended by many European leaders and senior representatives. China will join other parties including European countries in discussions on how to advance BRI cooperation to ensure this road of opportunity and cooperation will enjoy broader prospects and smoother progress. Q: Over the weekend, there were reports from the Reuters saying that China has made a complaint in the WTO about the Australian government's decision to ban Huawei from supplying equipment for 5G. Could you confirm that? What are China's plans at the WTO? Do you plan to make a complaint against the Australian government? What actions might you take on this situation regarding Australia and 5G? A: China's position on 5G cooperation is very clear. As we repeatedly emphasized, we hope countries can continue to take measures conducive to trade and investment facilitation and liberalization and win-win cooperation, which will deliver benefits to all economies. The Chinese government expects other governments to foster a fair, open, transparent and non-discriminatory market environment. Any country adopting discriminatory practices, no matter under what pretext, will only hurt its own international cooperation and forfeit the benefits it could have gained. As to your question, I'd refer you to the Ministry of Commerce for more details. What I can tell you is that China upholds the rules-based multilateral trading system with the WTO at its core. Q: Japanese Foreign Minister Taro Kono began visiting China last Saturday. Today Premier Li Keqiang and State Councilor Wang Yi met and held talks with him respectively. Could you please give us more details? Did they talk about President Xi's visit to Japan? How does China view this visit by Foreign Minister Taro Kono and other members of the Cabinet of Japan? A: We will release the official readout of Foreign Minister Taro Kono's visit to China and his meetings and talks with Chinese leaders in due course. You may refer to that later. According to the information I have at this moment, Premier Li Keqiang met with Foreign Minister Taro Kono and State Councilor and Foreign Minister Wang Yi held talks with him. State Councilor Wang Yi stressed that in the face of profound changes unseen in a century, it is even more important and necessary for the two countries to step up coordination and cooperation. The two sides should remain committed to the general direction of peace and friendship, follow through on the political consensus of being cooperative partners instead of threats to one another and supporting each other's peaceful development, and achieve common development through mutually beneficial cooperation. The China-Japan relationship has just begun to improve. While facing important opportunities, it is still sensitive and fragile. The Japanese side said many times that China and Japan should switch from competition to coordination and we hope that Japan will roll out more practical measures to this end. Specifically, first, we hope that the two sides will continue to enhance political mutual trust and ensure that the bilateral relations will always remain on the right track under the guidance of the four political documents and the important consensus between the leaders of the two countries; second, we need to improve and upgrade the bilateral practical cooperation and make a bigger pie of common interests for mutual benefit and win-win results. State Councilor Wang Yi made it very clear that China welcomes Japan's high-level delegation to the Second BRF; third, we need to continue to promote cultural and people-to-people exchanges so as to gain more public support for developing the bilateral relations; fourth, we should stay committed to managing differences in a constructive manner through dialogue and negotiation. In the meantime, China and Japan share extensive common interests in the multilateral field. We should strengthen our communication and coordination in such multilateral mechanisms as the G20 and the WTO, jointly uphold multilateralism and the free trading system, and improve global governance. State Councilor Wang Yi said explicitly that China supports Japan in hosting a successful G20 Osaka summit. Foreign Minister Taro Kono also made positive remarks, for which you may refer to the Japanese delegation. Foreign Minister Taro Kono led a group of Japanese Cabinet ministers to China and exchanged in-depth views with the Chinese side on China-Japan relations and issues of mutual interest. You may have noted that the two sides have held a series of activities, including the opening ceremony of the China-Japan Youth Exchange Year yesterday. We hope that Foreign Minister Taro Kono's visit to China will be conducive to the further development of China-Japan relations in the new era and helping the bilateral relations to maintain the momentum of improvement and development in the right track. We believe that as long as the two sides remain committed to their consensus, this visit will surely prove to be a significant event. You asked about whether the two sides talked about the Chinese leader's visit to Japan, as we said on many occasions, high-level exchanges are of important significance to promoting China-Japan relations and the two sides should make positive efforts to this end. Q: Last week, you refuted reports alleging that high-level employees of the Dutch chip-maker ASML stole its technologies and passed them to the Chinese government. We noted that ASML later issued a notice to clarify the situation. ASML CEO Peter Wennink also denied false reports that there was any national conspiracy to steal information from his company. Do you have further comments on this? A: We have noted the statement made by ASML. As for any further comments, maybe it is time that the Dutch newspaper that spread this rumor in the first place gave some explanations. I would like to reiterate that when it comes to respecting and protecting intellectual property rights, our attitude is serious and our actions are effective. Just like what the ASML CEO has pointed out, China has taken effective measures to respect and protect intellectual property rights. We stand ready to continue to strengthen the mutually beneficial cooperation with the Dutch side in the scientific and technological sector and conduct dialogue, exchange and cooperation in protecting intellectual property. Q: On April 12, Pakistan's Ministry of Foreign Affairs launched the Guidelines for the Implementation of the UNSC Resolutions Concerning Targeted Financial Sanctions, Travel Ban and Arms Embargo to further oversee and guide the federal and provincial governments' implementation of sanctions against individuals and entities designated by the UNSC. What is your comment? 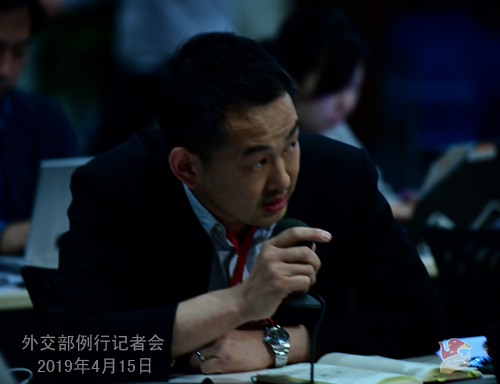 A: China has noted relevant reports. The issuance of the Guidelines is the latest step taken by Pakistan to implement its National Action Plan to counter terrorism, which showcases Pakistan's position and determination to resolutely combat terrorism and implement relevant UNSC sanctions resolution. China commends that. Pakistan is an important participant in the global fight against terrorism and has made tremendous efforts and sacrifices for international counter-terrorism cooperation and the international counter-terrorism cause. 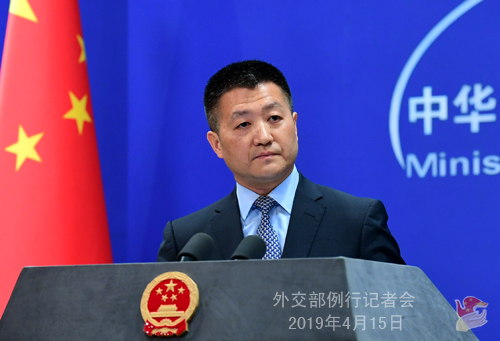 China supports Pakistan in advancing its counter-terrorism efforts in light of its own national conditions and hopes that the international community will strengthen counter-terrorism cooperation to jointly uphold global and regional peace and stability. Q: A question about the Belt and Road. India is highly unlikely to attend the second Belt and Road Forum. In an interview with a Chinese media last month, Indian envoy hinted that. He said no country can participate in an initiative that ignores its core concerns of sovereignty and territorial integrity. What does China think of India's view? A: You should ask the Indian side if its government or various communities will participate in BRI cooperation or related activities. While the BRI was proposed by China, it has grown into an international public good. The success of the first BRF together with the bumper practical outcomes speaks volumes. The fact that more countries and international organizations are taking an active part in the second forum is further proof to its success. You mentioned misgivings some people in India cite for not participating in BRI cooperation, in particular, Indian's core concerns. I would like to reiterate that the BRI is an open and inclusive initiative for economic cooperation. It never concerns territorial disputes. In pursuing BRI cooperation, China and partner countries are committed to equality, openness and transparency, to business operations centered around enterprises and to market rules and international norms. For those with inaccurate judgment on the BRI based on misunderstandings due to lack of knowledge of the real situation, I would like to reassure them that China is sincerely and resolutely committed to the principle of consultation and cooperation for shared benefit, equality and mutual benefit. Follow-up: You are saying that this time a lot of international organizations are coming to participate in the Belt and Road Forum. Are you trying to say that if India does not participate this time again, it's going to miss out a lot? A: Since its initiation, the Belt and Road cooperation has been inclusive and open to all countries that are interested in joining and working for win-win cooperation. It excludes no one. If the relevant country would like to take some time to see, we can wait. You asked whether not participating means missing out opportunities as this time a lot of countries and international organizations are coming to participate in the second BRF. I am afraid you have to ask the countries that choose not to participate. Q: DPRK's Supreme Leader Kim Jong-un said that he would like to have a third meeting with US President Trump. What is your comment? A: Sustaining the momentum for dialogue on the Korean Peninsula issue to resolve all relevant parties' concerns and realize denuclearization serves the common interests of all sides and meets the expectations of the international community. China has all along encouraged the DPRK and the US to meet each other half way, stick to the right direction of settling the issue through dialogue, step up engagement, take phased and synchronized steps as part of a package solution, respect and accommodate each other's legitimate concerns, narrow differences and expand consensus, and work with all parties concerned towards denuclearization and a political settlement.